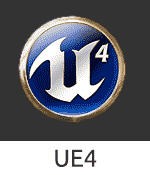 In this tutorial I am going to give you a basic run down of the the user interface in Unreal Engine 4. 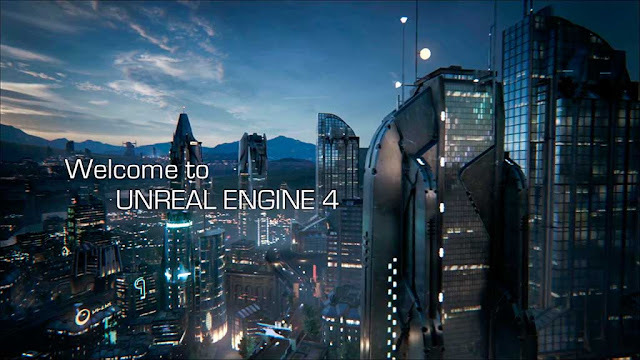 After reading this tutorial you will be able to start your own Unreal Engine 4 project and know your way around the interface you are given to create a game. 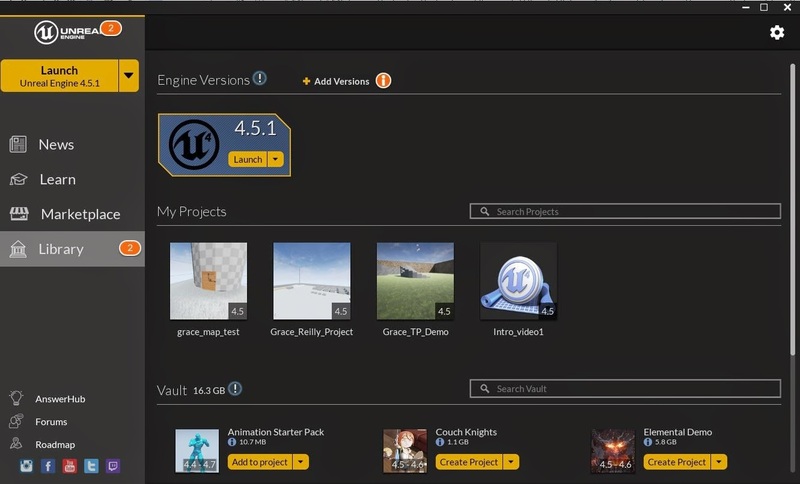 Create an account with unreal engine. Sign in. When you sign in, you see the menu screen. 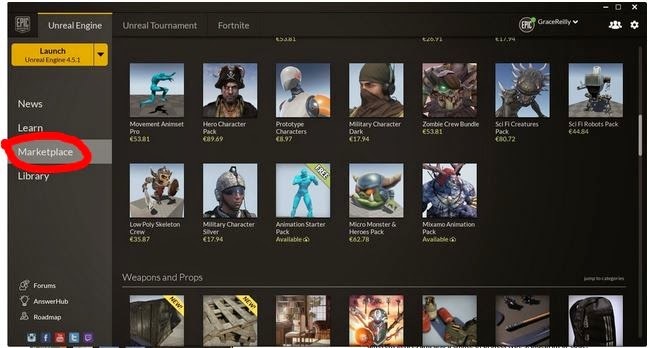 From the Marketplace, you can download different free useful packages including characters. From there you can add these to your project. All downloaded packages can be found in the library. Launch button and Library location. First time you launch the engine, you will see the unreal engine project browser. From here, you can create a new project or go on to the Marketplace and load an existing project. When creating a new project, there are a variety of different genres and also a choice of project type’s, blueprint or code. When making settings, we recommend the following. You then choose an appropriate location to save it and you give it a project name. 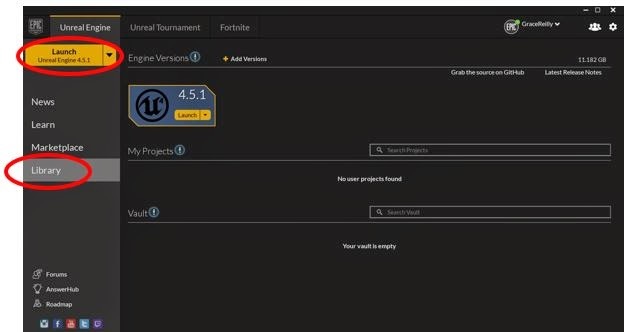 Choose location to save your project and name it. Note: when naming, do not use spaces, use an underscore. Then you save and click CREATE PROJECT. Pretty much any menu bar you see in computer applications, file menu, edit menu, window menu and the help menu. File - Here you can save what you are working on, create new projects, import and export. 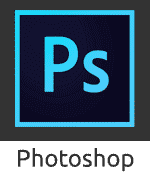 Edit – You can find the standard Undo, redo, cut, copy, paste. 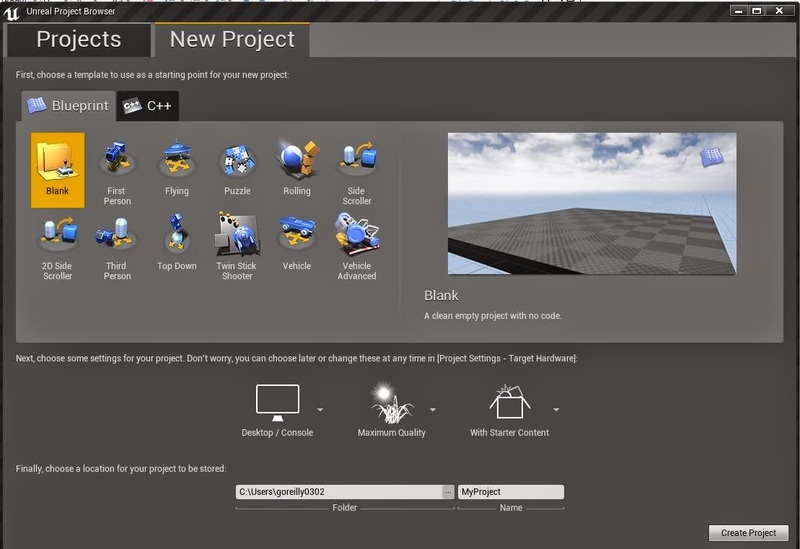 Also here you can find editor preference and your project settings. 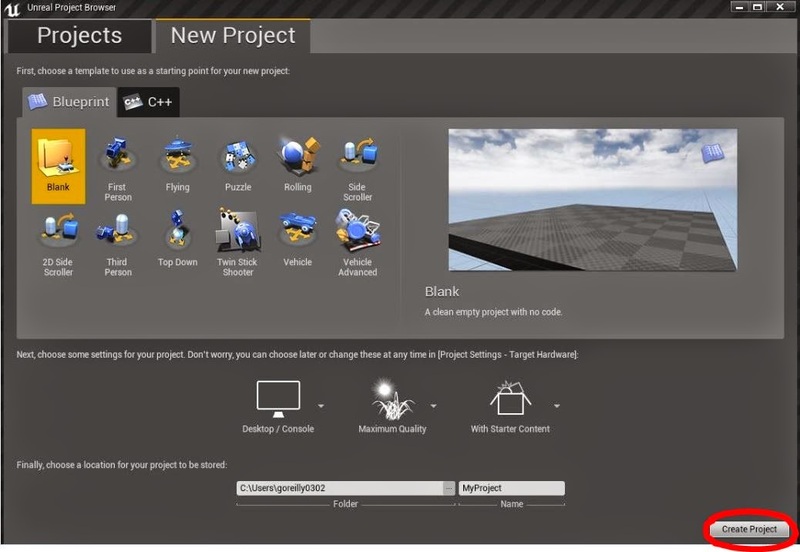 On your view port here are meshes already in place because you chose to include starter content. These meshes are not permanent and can be edited, as shown in a later tutorial. 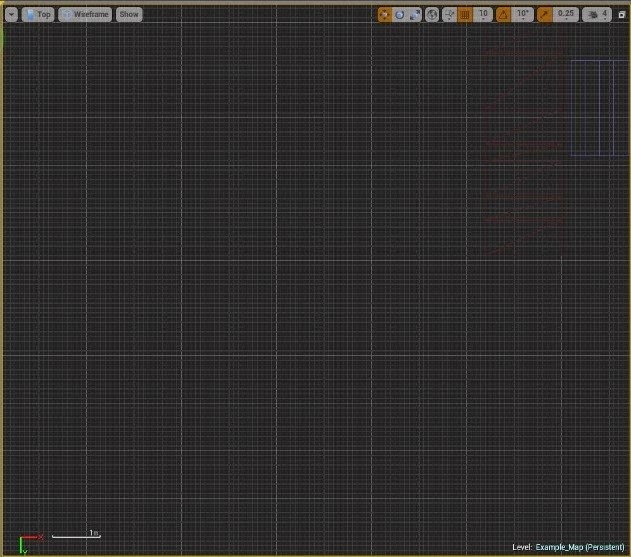 Mode panel, this allows us to change the mode the editor is currently in. 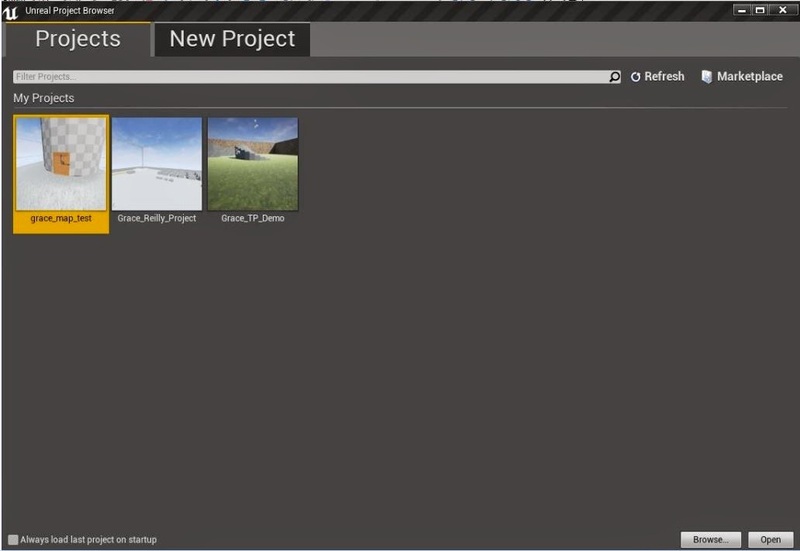 You can select modes place mode, landscape, paint, foliage and geometry editing mode. 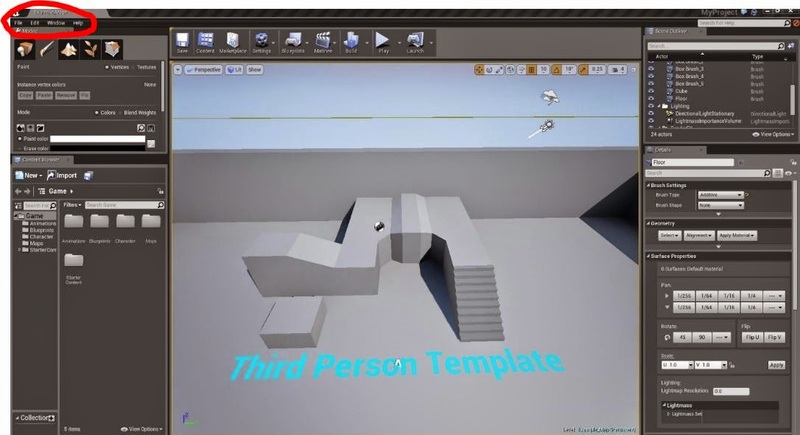 Allow you access to any exterior generated content and special content like materials and blueprints you may have created. 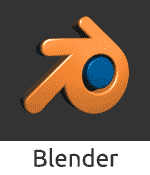 Here you can create new folders and import different meshes, sound and textures/materials. The scene outliner panel, shows everything that is in your level at that time. Main use is to see all the objects in your screen and select them. It has some other functionality like here you can select, edit, parent together, hide and delete objects/actors. The details panel shows all editing details on a selected item. you have your save button (but generally you can just hit ctrl+s), content to open the content browser if you don’t already have one opened. Marketplace. Your settings, control various things that you can show and hide inside of your view port and overall environment. When editing, make sure you save your work frequently and build when progress is made. When you press the play button a character will appear, this gives you a good idea of how your level will look and function. To escape play mode press eject. The short cut for this on your keyboard is ESC. If you drag with the left click, to go forward you drag up and to go backwards you drag down. Move the mouse left to right while still holding down the left of the mouse to look left and right. Right click is just looking around, you can look left, right, up and down by dragging the mouse up, down, left and right. If you click the mouse wheel you can track the camera in all directions by sliding up and down, left and right. Click the left and right of the mouse at the same time does the same thing. You can change the speed of the camera in the upper right corner of the viewport. Camera speed option zoomed in. Hold down alt to use this style of navigation. Alt+left mouse click is going to tumble the view around. To change pivot of the tumble you can select any object in your scene and hit “f” on your keyboard. 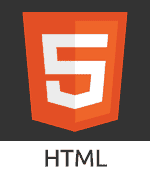 Now when you hold down alt and drag with the left mouse you are tumbling around the object. 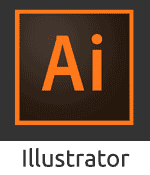 When duplicating an object hold down the alt+click the direction you want to go in on the anchor + hold down shift. You can also look at your level through different viewpoints. 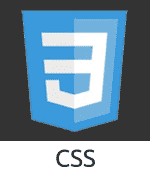 You can find the option to change views in the top left hand corner of your 3D viewport. In the dropdown, there are a variety of different views including perspective, top, side, and front.